Wisconsin educators, policy makers and parents now have a new way to visualize and analyze the state’s education data and trends. WISEmaps is an interactive mapping application developed by Blue Raster in collaboration with REL Midwest (Midwest Regional Educational Laboratories) and the Wisconsin Department of Public Instruction (DPI), for the purpose of sharing Wisconsin education data with the public in a compelling way. 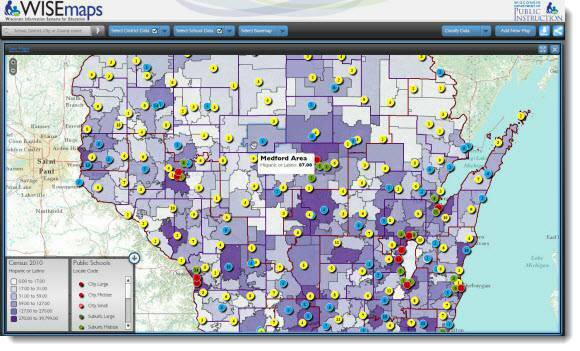 The application, which is part of DPI’s Wisconsin Information System for Education (WISE), was built by Blue Raster using Esri ArcGIS API for Flex. WISEmaps gives citizens the opportunity to examine Wisconsin education and demographic statistics at the school, district, city or county level. The data includes more than 5,000 indicators, including statistics regarding enrollment, math and reading assessments, and high school completion rates. WISEmaps features a split screen function, which makes it easy for users to compare multiple maps, view trends across time, or identify correlations among datasets. To enhance their maps, users can choose options such as color scheme, layer transparency and map type (street level, topographic, canvas or satellite imagery). The customized maps can be exported as images or PDF files or shared via Twitter.